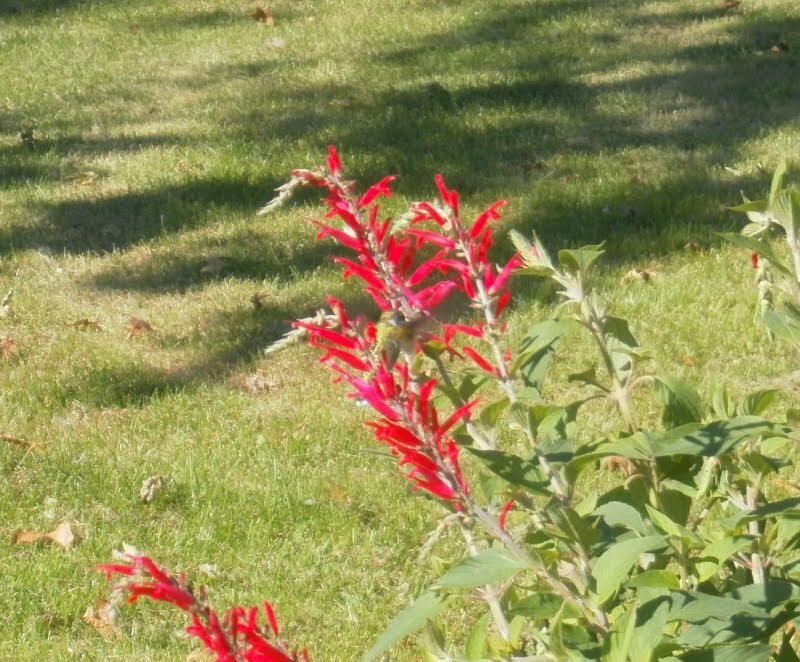 So I've been trying to take photos of the Salvia elegans I planted in the back, the ones that didn't explode, regularly as they begin to bloom. The objective is not to get a time-lapse sequence of the bloom, though I probably could do that if I really tried, but to keep taking pictures as long as the blooms are continuing to get more abundant, because I worry that if I wait until they're at the absolute peak, that at some point before the plant peaks, we'll get a big windstorm that will tear the plants apart and then I'll have no pictures of anything. So that's what I was doing outside with the camera. 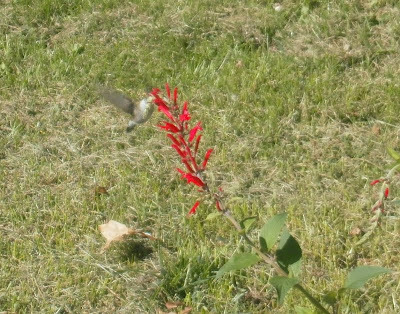 From looking around a little bit on-line, the pictures, and memory, I think this was most likely a female ruby-throated hummingbird (Archilochus colubris). 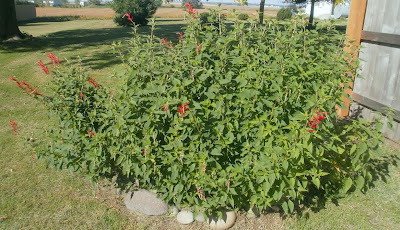 I didn't plant the pineapple sage specifically to get hummingbirds, and actually I'd pretty much forgotten that hummingbirds were even a possibility -- I see one maybe once a year. So this was a nice bonus. Next year, there will be more plants, and I'll figure out how to protect them from the wind a little better. I'm told hummingbirds remember the locations of food sources from year to year. Don't want to disappoint. The call of outdoor gardening exerts its pull on another one... Soon you'll be posting a new landscape plan that involves a vegetable garden! That is kind of cool! I saw a chipmunk today--not as delightful, but a rare occurrence for me. It's nice when Nature's all like "hey, remember me?" I've been lucky and have seen many this year, esp in September. Usually see only 1 or 2, and that's in May or June. I only know they come because I can hear them, but did get some pics I posted a few weeks back. They are fleating. Like my brown hair turning gray. Oh great, you stole my hummingbird. Thanks. Thanks a lot, mr_s. Wind is a harsh mistress. I'm still learning how to cope. 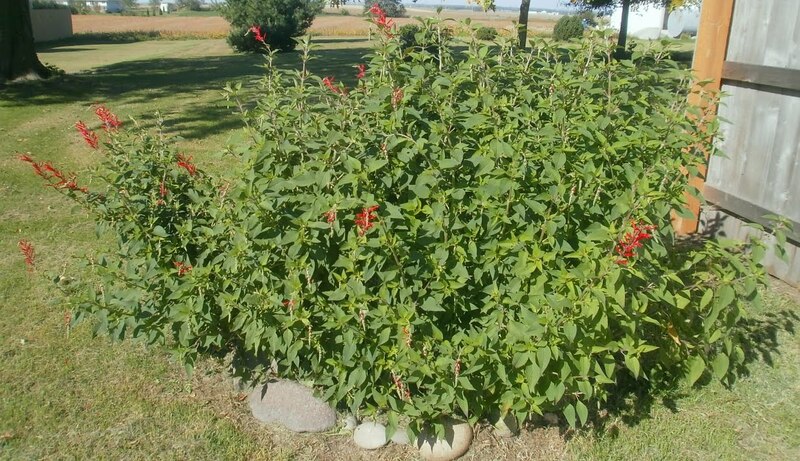 If you're plotting more plants for that same area, you can effectively build layers around it (light providing) so that wind is minimal on the salvia itself. Wildflowers and herbs are extremely helpful there, especially lemongrass, bundleflower, phlox, and twinflower. Mmm. Hadn't thought about that. If I plant an unbroken line of them where a fence should be in the back yard, will one try to claim the whole line, or will they divide it up among themselves? 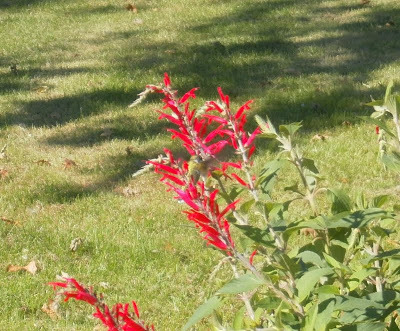 I mean, I could put some in the front yard too, maybe, but we never spend any time in the front yard, so it'd be a lot of trouble to go to just to feed one hummingbird. Technically, there was a vegetable garden already. Just tomatoes, and most of them cracked, and the cherry tomatoes were the only ones that really worked out at all, but that's still more successful than last year's attempt was. Mainly what we've had around the yard this year is dragonflies. All over the place, constantly. Not that there haven't always been some dragonflies around, but I'd never seen anything like this year. Well, you weren't using it. They tend to be territorial around line of sight I think. They like to sit and watch their favorite feeding spot and dive when another interloper appears. The Rufous is the worst. Mean little bugger. You'd notice him stand out though, he's flaming iridescent orange. Just like the pretty boys to be real snots. However, that may not be the case with yours, since they really aren't hanging around for long periods, just passing through on the way south. 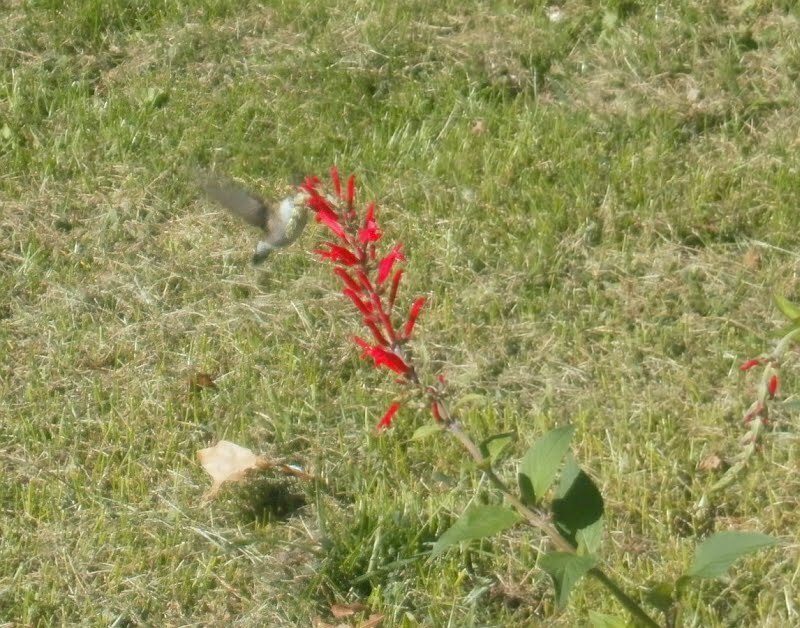 There's a hummingbird that occasionally shows up in our neighborhood. He(?) usually sits on one of the powerlines and sings, a long chirp with a raspy burr quality, it's hard to describe. He's surprisingly loud for such a little guy.